SILER CITY, N.C. — “Sing and Play,” the second-annual musical competition for students from elementary through high school, will be held next month at Jordan-Matthews High School in Siler City. Instrumental and vocal acts will compete for a $50 prize awarded for the best performance in each of three age categories — elementary, middle school and high school. Acts may be individuals or groups up to four people, with all performers being full-time students in a North Carolina public, private or home school. Auditions will be held at Jordan-Matthews on February 5 beginning at 3:30 p.m., when a panel of judges will select four to six acts in each age category to perform in the competition. Each act selected during auditions must pay a $10 registration fee to enter the competition. Individuals and groups interested in auditioning must register online by January 29. The “Sing and Play” showcase competition concert will be held on February 21, at 6:30 p.m., in the Jordan-Matthews Auditorium. Immediately after the performances, winners will be selected by audience vote. General admission is $5 per person and includes one vote in each category. An overview of the competition — including rules and a link to the registration form — is available online at jmarts.org/s/SingAndPlay19Rules.pdf. “Sing and Play” is a fundraiser for JMArts, the Jordan-Matthews Arts Foundation, a nonprofit created to provide what student artists need to excel. Money raised by the competition will be used by JMArts for educational projects, including its second-annual New York Arts Adventure. Scheduled over spring break, the educational trip to New York City gives a group of upperclass musicians, actors and visual artists an opportunity to explore one of the world’s great cities, experience the very best in the arts and gain new perspectives and experiences that will influence their lives and work. Several world-class artists will meet with JM artists during the five-day adventure. More information about JMArts and other events scheduled for this season is available at jmarts.org. 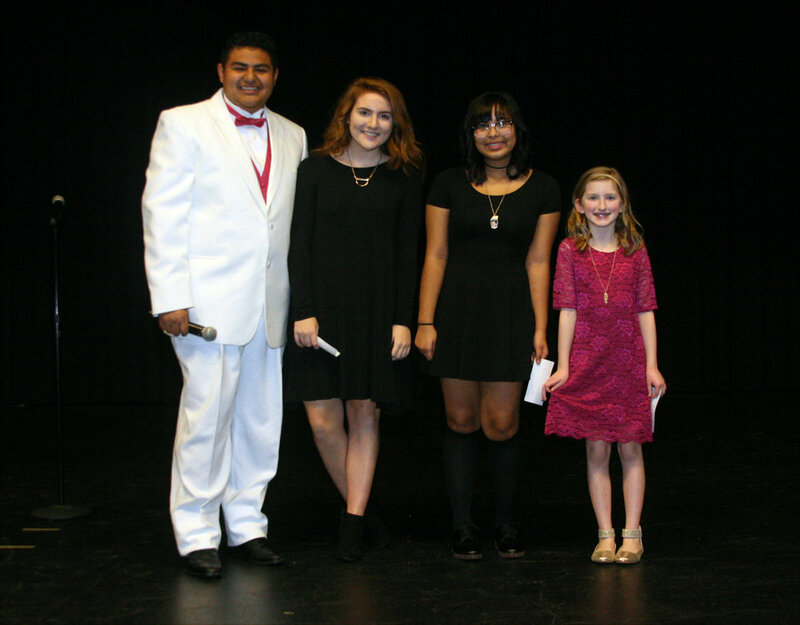 Master of ceremonies Orlando Balderas, from left, stands with Sing and Play ’18 winners Corrine Collison, Edith Soto and Kaitlyn Evans. Registration is now open for Sing and Play ’19, which will be held in February at Jordan-Matthews High School. SILER CITY, N.C. — Registration is now open for Sing and Play ’19, the second-annual musical competition scheduled for February at Jordan-Matthews High School. Sing and Play highlights musical talent in separate competitions for elementary, middle and high school musicians. Vocalists and instrumentalists who are students in a North Carolina public, private or home school may register through January 29 to receive an audition appointment and perform either as an individual or in an ensemble of up to four musicians. Acts selected during auditions on February 5 will participate in the Sing and Play ’19 Showcase Competition on February 21, where audience members will select the winner in each age-based competition. General admission to the showcase is $5 per person. Each of the three winning acts receives a $50 cash prize. Rules and registration information are available online at JMArts.org/events/. “This will be a great show. Our community really enjoyed it last year,” said Greg Burriss, director of this season's competition. “But we really want to provide this opportunity for young musicians to sing and play before a live audience, to have that challenge and experience in this supportive environment. For students interested in performing, even the audition can be an educational opportunity." Sing and Play ’18 winners were Kaitlyn Evans of Chatham Charter School, Edith Soto of Chatham Middle School and Corrine Collison of Jordan-Matthews High School. Sing and Play is produced by JMArts, the Jordan-Matthews Arts Foundation. All proceeds from the event are used by JMArts to help high school artists thrive. More about the foundation and competition is available online at JMArts.org. Corrine Collison, then a junior at Jordan-Matthews High School, won the Sing and Play ’18 high school competition back in February. She recently performed on stage as Ursula in the school’s production of “Disney’s The Little Mermaid." Greg Burriss named director of second-annual "Sing and Play"
SILER CITY, N.C. — Greg Burriss, a musician and pastor of Rocky River Baptist Church near Siler City, has been named director of Sing and Play ’19, the second-annual musical competition sponsored by JMArts, the Jordan-Matthews Arts Foundation. Sing and Play highlights talent in separate divisions for elementary, middle and high school musicians — either vocalists or instrumentalists, who may perform individually or in small ensembles. Contestants must be students attending a public, private or home school in North Carolina. Winners will be selected by audience vote during a showcase concert on Feb. 21 at Jordan-Matthews High School, with auditions being held on Feb. 5. Each of the three winning acts receives a $50 cash prize. Burriss served as an audition judge during the inaugural Sing and Play earlier this year. He is a vocalist and mandolin player for the New Direction bluegrass band and performs frequently at Rocky River Baptist Church. He also is an actor who appeared locally in Temple Theatre’s 2008 production of “Footloose." Last year’s winners were Kaitlyn Evans of Chatham Charter School, Edith Soto of Chatham Middle School and Corrine Collison of Jordan-Matthews High School. Sing and Play raises money used by JMArts to help high school artists thrive. More about the foundation and competition is available online at JMArts.org. Greg Burriss, right, consults with Joey Walden while judging auditions during Sing and Play ’18 in February. Burriss has been named director of Sing and Play ’19, the second-annual musical competition scheduled for February at Jordan-Matthews High School.